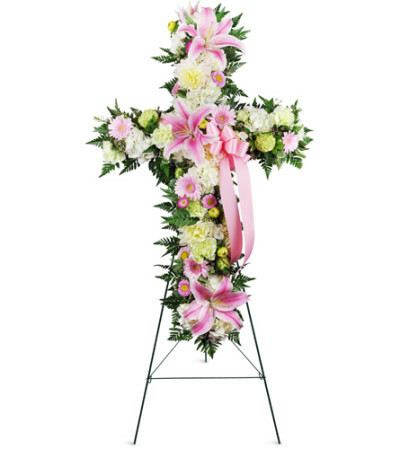 A comforting expression of faith eternal, our soft pink sympathy cross brings solace with beautiful stargazer lilies, peonies, and pink Gerbera daisies. 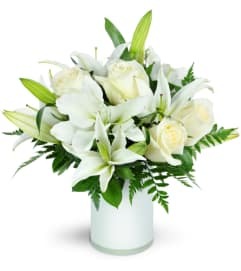 This floral cross is unique and tastefully understated, delivering your condolences with heartfelt grace and distinction. This gift is sure to be remembered by friends and family as they celebrate the life of their dearly departed loved one. Gorgeous stargazer lilies adorn the main body of this floral spray cross arrangement, enhanced with soft pink dahlias and sweet pink Gerbera daisies. Great flowers, great staff, great price. The only flower shop I use. Blossoms Flower Shop is a Lovingly Florist in Brighton. Buying local matters. Discover how Lovingly supports local florists. Copyrighted images herein are used with permission by Blossoms Flower Shop.